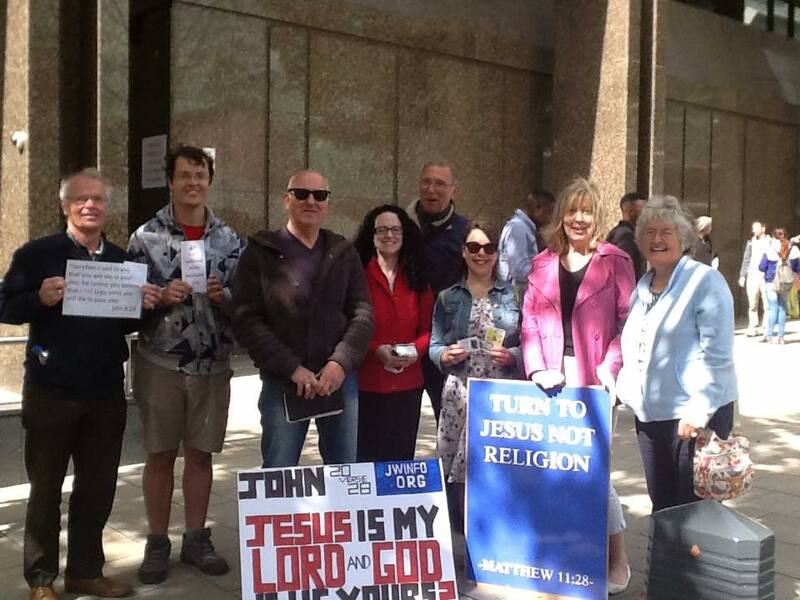 So for the 3rd year in a row, Leeds was ascended on by 10,000 Jehovah’s Witnesses and 15 Christians that love them enough to preach the truth to them. You may wonder why we go and do this, I mean after all don’t most Jehovah’s Witnesses just ignore you? Yes most do, but we don’t go for the 9,998 people who ignore you and walk on, we go for the 2 that are just crying out for help. Or one of the other signs…. However while most walked on by, one man we shall call “David” actually stopped to talk. He has been a Jehovah’s Witness for 15 years. He was a Methodist and became a Jehovah’s Witness after his church could not answer his questions that Jehovah’s Witnesses gave him. He instantly wanted to talk about the Trinity and why it is a heresy. I asked him…”how many God’s do you obey?” he said “One, Jehovah”. I then asked …..”would you obey Jesus?”….you could see the cogs turning…..”Yes, I would obey Jesus, but I wouldn’t worship him”. I said “Ok, but is Jesus not A God…John 1:1?” , “Yes he is A God, but not THE God”….”Oh, I said I thought you only obey ONE God, but you actually obey TWO Gods?? Is that right? ?”….you again could see the cogs turn. Then I showed him Isaiah 45:5 “I am JEHOVAH there is NO OTHER God beside me….but you believe Jesus is an “other God” don’t you? Shortly after he said “I have to go, but you have impressed me”. Through the whole the conversation someone was standing listening to the whole conversation as well. Trev and I prayed together and we hope a seed has been planted. 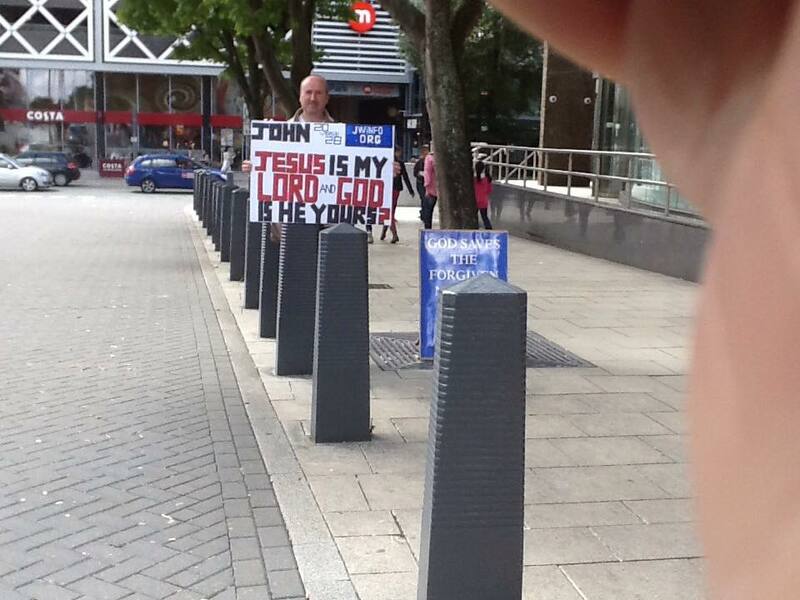 As John Steele and Jason Wright continued to preach, Christchurch in Leeds continued to give out flyers and engage people. At about 10 am everyone started to go in. Before then going for breakfast though we prayed over the morning’s activity, and then came my favourite part of the day…..
We started singing amazing grace, and then some other worship songs. However we hadn’t got any sheets with the words on, so we struggled on. Tony Brown then said “don’t worry the angels will be helping us”. Then we started singing “I lift my hands” but again forget the words…literally at that moment out of nowhere this sister came and joined the circle we were in and lead us in worship for that hymn!! She then said “may God bless you today” and then walked off, we have no idea who this sister was and likely will never see her again. Certainly the words of Tony Brown about the angels helping really did come true. It just gave me that really comfort that we were being watched and looked after by the Lord. During the lunch time the arena emptied and once again we had an opportunity to speak to them. Although only about 20 leaflets were given out, one man almost snatched it out of Jason Wright’s hand and put it in his pocket. He then said “I’m with you”. It looked like this man had enough of the Watchtower and was on his way out. So a blessed day once again in Leeds, a massive thanks to Janet and all from Christchurch in Leeds for your support and to all those that came to the outreach.